Hey Raleigh!!!! 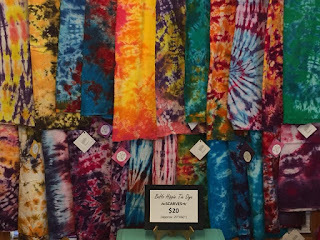 Here is your chance to see my tie dyed scarves up close and personal!!! I will be at Lasting Impressions in Fuquay, 11/24-26/17!! Lasting Impressions is a locally run artist fair and show for the holidays. You can find fine arts and crafts ranging from oil and watercolor paintings, pottery, wreaths, jewelry, fused, stained and dichroic glass, Holiday ornaments, baked goods, candy, scarves, doll clothes and more.